Location – Where is Blue Osa? All Canadian, US and EU citizens who travel to Costa Rica for tourism and pleasure purposes need a valid passport. Please check your passport to make sure you have at least 6 months validity from the time you enter Costa Rica. If it is not, you should get your passport renewed before you come to Blue Osa. A visa is not required. You NEED to know these things prior to coming to Blue Osa. Some articles of interest before coming – be informed and know where you are going. 1. 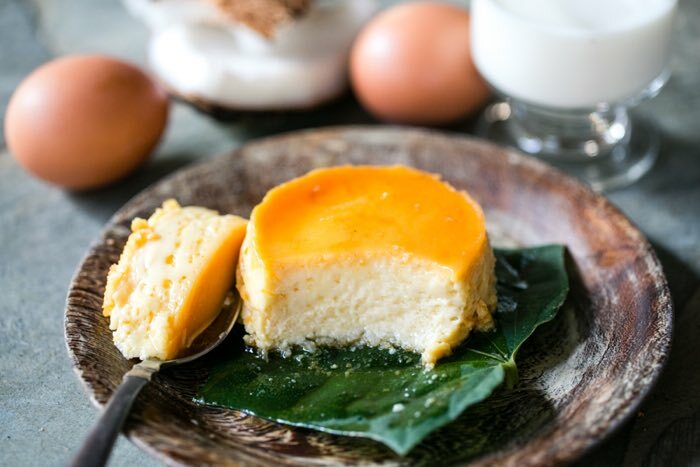 What Is Costa Rican Cuisine and what kind of food to expect at Blue Osa? Click here. 2. The real costs of Costa Rica. Click here! 3. Water is life at Blue Osa. Click here! 4. The realities of being in the jungle and off the grid. Click here! Staying In San Jose? Here are some suggestions. We REALLY encourage you to plan a night or two in San Jose when traveling to Blue Osa. There are so many things to do (click here), and really great places to stay (click here). Stop rushing, get out, and EXPLORE Costa Rica on your way to Blue Osa. Because the Osa Peninsula is blessed with wonderful weather all year-round, there really isn’t a “best” time to visit because the weather is gorgeous all the time. Though most guidebooks list the ideal time to travel to Costa Rica as December through May, we enjoy a stable climate of 75-85 degrees relatively year-round. Of course, don’t try looking for that information via online weather reports. Our private oasis is SO off the map, Google has yet to find us. Bottom line! The time to visit is whenever you want! Click here to read our Daily Weather Reports. Items and activities purchased at Blue Osa can be charged to your room and paid with a credit card at the end of your stay. (We ONLY accept Visa and Mastercard.) The amount of local currency that you need depends on how much you intend to spend on extra purchases outside of the property. If you are using your credit cards when you travel, please advise your bank that you will be making charges internationally. For Americans, it is not necessary to convert any money to local currency (colones) as all businesses happily accept U.S. dollars (however, expect your change to be in colones). In fact, we suggest that you do NOT change any money and bring several smaller bills so you do not receive any change. The current rate of exchange fluctuates around 600 colones for every 1 US dollar. You do not need any shots or vaccines before visiting Costa Rica. Please read through our Frequently Asked Questions Page. Upon your arrival into San Jose at Juan Santamaria International Airport (SJO), you will need to make a connection that will bring you south to Puerto Jimenez, on the Osa Peninsula. FLY: A flight from San Jose (SJO) to Puerto Jimenez takes approximately 45 minutes. (Click here to read more about Puerto Jimenez and click here to read more about the Osa Peninsula. Our team at Blue Osa Travels will assist you with your travel needs and be able to offer our exclusive hotel rates for your first and last night in San Jose. Remember if you arrive early and feel adventurous, Costa Rica has it all! Whether your dream is rappelling down a waterfall or flying over the treetops of a rainforest on a canopy tour, Blue Osa Travels || Yoga Travel Costa Rica, can ensure that your vacation wishes come true at no additional cost. Contact us to start planning your trip to Blue Osa! Please take note that when you book one of our Blue Osa Packages, we take care of your travel needs. 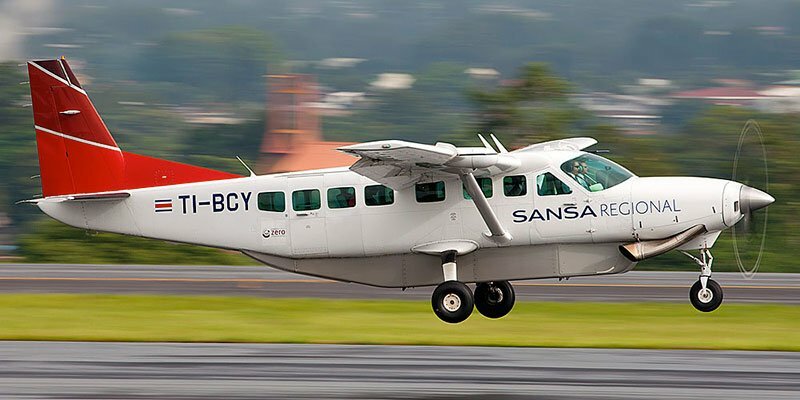 Alternatively, you can book your flights directly Costa Rica’s national airline, Sansa Air, or Skyways. There is another local airline you can take. If you are staying over night, you may want to consider booking with Aerobell as it is located in Pavas, which is much closer to downtown San Jose. ONCE YOU BOOK YOUR LOCAL FLIGHTS please email us to arrange a Blue Osa shuttle to and from the Puerto Jimenez Airport. Include your full name, arrival and departure times on Sansa. If you are booking the flights with Isaac, he will arrange the shuttles. One easy step. If you are visiting Blue Osa with a group retreat, give this information to your group leader to schedule with Blue Osa as soon as it’s available. Once the shuttle request form is received by us, a shuttle confirmation will be emailed to you. Blue Osa is 20 – 30 minutes from the Puerto Jimenez airport. Our shuttle service is $29 each way. The Sansa/Skyways Airport terminal is about 100 meters (literally) from the International airport. Once you exit from immigration, you take your luggage and walk left. You will exit the terminal onto the main street and then keep walking until you come to the airport. Recommended car rental companies – Solid Rent a Car and Toyota. 4 wheel drive is recommended. Traveling by bus is recommended only by experienced travelers or if you are adequate in the Spanish language. You can do some additional research on the internet on where the terminal is in San Jose. This is the current website information we have on where to buy your tickets. Click here to read a full description of the journey. There are only a few reasons why you might need to use this option. 1. The are no flights available between San Jose + Puerto Jimenez. 3. You have taken a bus to Golfito. The ferry from Golfito to Puerto Jimenez takes 30 minutes. There is no pre-booking available and it is good to show up 20 – 30 minutes in advance to guarantee a spot on the boar. Someone always sells tickets someone on the way to the boat. The cost is $6 or 3000 colones. The schedule we have posted is the most current, but is subject to change without warning or notice. If you need help booking flights and travel to San Jose Costa Rica (SJO), we highly suggest contacting our international travel agent, Cheri. 1. Help you with all of your domestic flights. 2. Take care of any additional nights you need in San Jose or Puerto Jimenez. 3. Book any day trip tours you would like to do in San Jose. 4. Help you book your accommodations in San Jose. Please take note that if you do book independently or with someone else, Blue Osa travels will not be able to provide a service to you while you are at Blue Osa. 1. Your international travel itinerary. 2. If you will need us to book any nights for you in Puerto Jimenez. 3. If you will need any additional nights in San Jose? 4. If you you would like to book any tours in San Jose? 5. Do you need us to help you with any other travel needs in Costa Rica. The tropical climate here makes it very comfortable to wear simple, lightweight clothing and footwear. Quick-to-dry clothing and tennis shoes, sandals, or water shoes work best. The Osa Peninsula is characterized by warm, breezy days, with highs between 82 and 92 degrees, and lows in the range of 70-80. Keep in mind that Blue Osa is surrounded by jungle so it is also often humid here. • A journal and pen for taking notes is usually considered essential. • Sunscreen/bug spray is available in the Blue Osa shop. • Umbrella if you are bothered when it rains. Blue Osa does provide TOWELS FOR THE BEACH AND SHOWER + BED SHEETS. You do not need to bring these items. 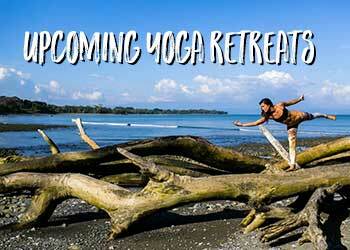 For the complete list of what to bring on your next Costa Rica Yoga Getaway, please click here. Morning Silence As a yogic practice at Blue Osa, we practice silence in the mornings until 7:30 (unless a group leader requests a later time) and ask all of our guests to observe this quiet time with us. The morning silence ends with a 8-min Himalayan chant that is played in the dining area. If you would like to learn more about this Himalayan Chant, please click here and learn more about the rituals of Blue Osa. Blue Osa offers a free WiFi service. This service is available in the main lounge area as well as the dining area. Since we practice mindfulness, the internet is turned off in the mornings until 7:30 am in during our practice of morning silence (which also ends at 7:30 am.) The internet is also turned off again at dinner from 6:30 pm until 7:15 pm. We do not have any computers available for use. Laundry service is available at Blue Osa. The cost for this service is $25 per load. Please expect laundry to be returned within 24 – 48 hours. Smoking – While Blue Osa promotes a non-smoking environment, we do provide designated smoking areas. There is NO SMOKING allowed in the rooms, and there is no smoking allowed in the common areas. Power voltage in Costa Rica is the same as the United States so no adapter is necessary. Hair dryers and flat irons are not available and are NOT allowed as our system can not handle the voltage. Blue Osa is operated mostly with solar power and we need to conserve energy. We ask that you share our desire to conserve power and water during your stay at Blue Osa. AC is NOT provided at Blue Osa. Each of our rooms is equipped with a ceiling fan, and the architectural design of Blue Osa allows for the constant flow of air through screen walls, creating a fresh and breezy environment, especially in the evenings. Communication – Sometimes some phones will work and sometimes they won’t. Blue Osa does provide a phone service for $2/minute and this service can be arranged at the office. While Wi-Fi service is free, we do not have any computers available for general use. Wine, Beer, Cocktails – Because of the difficulties in maintaining a minibar service at Blue Osa, we are unable to provide for the consumption of outside food, drinks or alcohol. Our bar is open throughout the day and we offer a selection of beer and wine and refreshing specialty drinks. If you still choose to consume privately bought alcohol please do so in the privacy of your room or on the beach. We do not allow privately bought alcohol in the dining room or at the pool. Drinking Water – While our water has been tested to ensure your safety, we provide filtered water in the Cocina. As we do not allow open cups on our yoga deck, we do invite our guests to bring a water bottle, or they may purchase one in the Blue Osa store. Credit Cards – The cost of eco tours, spa treatments, and other incidentals will be charged to your room and is payable at departure. Blue Osa accepts Visa and MasterCard (we not accept American Express). Cash is always the preferred method of payment when settling your bill. Tips for services rendered are very much appreciated by Blue Osa’s hardworking staff. At the end of the week, you may leave a cash tip in our tip box. All tips will be pooled and divided evenly among our staff of about 17 people who work in the kitchen, garden, office and housekeeping staff. If you would like to tip individually, you may do that also at check-out. As a guide, may we suggest a tip of $20 – $40/day. Likewise, tips for individually booked spa treatments and eco-tours are left to your discretion. Please note that we only accept cash tips. We are unable to process tips through your credit card. We do suggest bringing enough cash for any tips, or extra services/shopping you may do outside of Blue Osa. Because we do not accept credit cards for tips, we do encourage you to bring some cash with you. We do occasionally have outside vendors come for a farmer’s market at Blue Osa, and there are others in the area. Our suggested cash amount is $250 to $400. A safe can be found in your room. If you would like to secure your valuables, please come to the office to get the key. A $25 fee will be added to your bill. Upon checkout, please return the key and the $25 fee will be voided. Emergency medical treatment is available, if necessary, in the Clinica Hospital in Puerto Jimenez and Golfito. In the event of an extreme emergency airlift to hospitals in San Isidro or San Jose is also available. For minor needs, the Puerto Jimenez pharmacy is staffed by very professional people. The best way to reach us is via email. Our phones do not often work as we are in the jungle. For emergency contact, our local cell phone is 011-506-8704-7006. Always email us in addition to calling. Blue Osa Spa is a peaceful sanctuary that is dedicated to your comfort and wellness. Our magnificent setting offers its own unique form of beauty with its proximity to both sea and jungle. Our philosophy embraces the concept of purity derived from our surroundings. We have created a holistic approach to treating the mind–body–spirit as one through a combination of our natural rainforest botanicals, massage, and different healing modalities borrowing from the Ayurvedic tradition. We have developed an extensive menu of services that incorporate the healing properties of the earth, ocean, and plants that thrive in the Osa Peninsula’s unparalleled environment. Please make reservations for spa services upon your arrival, so that we can help plan your experience. Please do not email us prior to your arrival to book your services. Click here to read more about our spa and plan which services you would like to include. 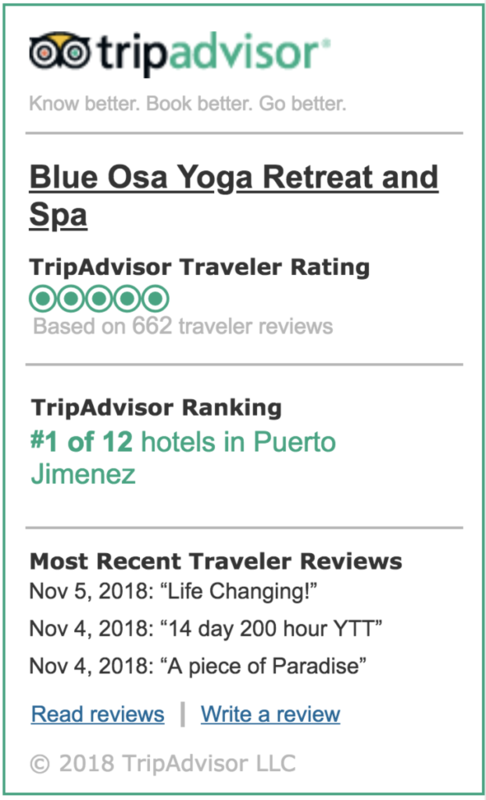 We encourage all of our guests, those who have a home practice and those who do not, to enhance the quality of their Blue Osa getaway by participating in both private and group yoga experiences. For guests not traveling with a group, we offer all levels of yoga taught by our instructors who are trained in the hatha-tradition. You may participate either in a group or individual class. We are fortunate to host a variety of exceptional yoga instructors Blue Osa. If retreat-sponsored classes are being held during your stay and you would like to join, requirements and fees are always set by retreat organizers. For our guests who are not participating in a yoga retreat, we offer a daily afternoon yoga class taught by our in-house yoga instructors. Guests who book through our website are welcome, free of charge. Group class frequency is subject to staff availability. Please go to www.BlueOsa.com/Yoga to read more about our yoga offerings. At Blue Osa we believe that nutritious, wholesome food is not only the foundation for a productive life, but is also essential for a happy one. Food that nourishes our soul not only needs to be healthy, but it also needs to be tasty and delicious! Blue Osa is devoted to serving the freshest ingredients possible that are delivered daily to our kitchen. We favor a buffet style of service, however, it is not an all-you-can-eat buffet. Meals are proportioned with optimum health in mind. No one leaves Blue Osa hungry: guaranteed. Our daytime meals are primarily vegetarian and our evening meals may include meat or fish. All inclusive meals included in your stay: Dinner on the day of arrival; breakfast, lunch and dinner on each full day; and breakfast on the day of departure to coincide with our check-in time of 2 PM and check-out time of 10 AM. A $25 fee will be added to your bill if you check-in early or check-out late. Please click here to read more about our cuisine. Please make reservations for tours upon your arrival, so that we can help plan your experience. Please do not email us prior to your arrival to book your tours. Transportation to tours is NOT included. Please click here to see the shuttle prices. Scroll down to the bottom of the page. Should you need to cancel your tour, please provide 24 hours notice to avoid incurring the full tour cost. If cancelled with less than 24 hours notice, we charge 50% of the tour cost. Please bring appropriate footwear. For most tours, TEVAS sandals are fine. Please bring running shoes for the waterfall, tree climbing, horseback riding, and zip-lining tour. Please bring your beach towel provided by Blue Osa with you and leave it in the vehicle during your tour. If you are wet upon returning, please sit on the towel. Please remember to put on sunscreen and bring sunscreen with you. Always bring your camera. If your tour involves water, dry bags are available. If you would like to tip the tour guides, please bring cash with you. Please kindly remember we do not have small bills at the office to make change.